Most employers qualify for 4980h transition relief, and we recommend selecting this when applicable as this will reduce your tax liability. To be eligible to use the Qualifying Offer Method for reporting, the employer must certify that it made a Qualifying Offer to one or more of its full-time employees for all months during the year in which the employee was a full-time employee for whom an employer shared responsibility payment could apply. To be eligible to use the Qualifying Offer Method Transition Relief, the employer must certify that it made a Qualifying Offer for one or more months of calendar year 2015 to at least 95% of its full-time employees. For this purpose, an employee in a Limited Non-Assessment Period is not included in the 95% calculation. 22c. Section 4980h Transition Relief - NOTE: This is based off of total aggregate ALE FTE count, not EIN FTE count. 2015 Transition Relief for Calculation of Assessable Payments Under Section 4980H(a) for ALEs with 100 or More Full-Time Employees, Including Full-Time Equivalent Employees (100 or More Transition Relief). To be eligible to use the 98% Offer Method, an employer must certify that taking into account all months during which the individuals were employees of the employer and were not in a Limited Non-Assessment Period, the employer offered, affordable health coverage providing minimum value to at least 98% of its employees for whom it is filing a Form 1095-C employee statement, and offered minimum essential coverage to those employees' dependents. If the employer offered minimum essential coverage to at least 95% of its full-time employees and their dependents for the entire calendar year, enter "X" in the "Yes" checkbox on line 23 for "All 12 Months" or for each of the 12 calendar months. If the employer offered minimum essential coverage to at least 95% of its full-time employees and their dependents only for certain calendar months, enter "X" in the "Yes" checkbox for each applicable month. For the months, if any, for which the employer did not offer minimum essential coverage to at least 95% of its full-time employees and their dependents, enter "X" in the "No" checkbox for each applicable month. 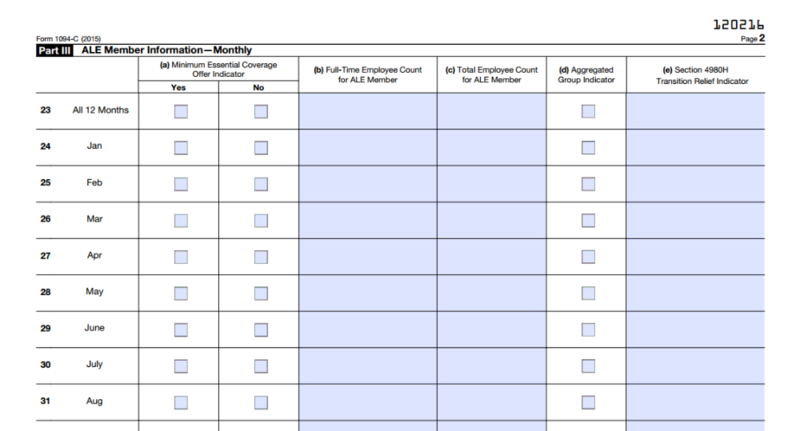 If the employer did not offer minimum essential coverage to at least 95% of its full-time employees and their dependents for any of the 12 months, enter "X" in the "No" checkbox for "All 12 Months" for each of the 12 calendar months. However, an employer that did not offer minimum essential coverage to at least 95% of its full-time employees and their dependents but is eligible for certain transition relief described in the instructions later under Section 4980H Transition Relief for 2015 should enter an "X" in the "Yes" checkbox for Part III, line 23, column (a), as applicable. See the instructions later under Section 4980H Transition Relief for 2015. If using the standard monthly measurement, you can measure this by calculating which employees have more than 130 hours of service in a month. Do not include employees in a limited non-assessment period in this count, and if you qualify for the 98% offer method, you can skip this. Enter the total number of all of your employees, including full-time employees and non-full-time employees and employees in a Limited Non-Assessment Period, for each calendar month. An employer must choose to use one of the following days of the month to determine the number of employees per month and must use that day for all months of the year: (1) the first day of each month; (2) the last day of each month; (3) the 12th day of each month; (4) the first day of the first payroll period that starts during each month; or (5) the last day of the first payroll period that starts during each month (provided that for each month that last day falls within the calendar month in which the payroll period starts). If the total number of employees was the same for every month of the entire calendar year, enter that number in line 23, column (c) "All 12 Months" or in the boxes for each month of the calendar year. If the number of employees for any month is zero, enter "0". Select every month in which the ALE member was part of an aggregate ALE group.